Our obsession with Peruvian cuisine continues! This time we explore Peruvian Criollo dishes. What is Peruvian Criollo food you might ask? 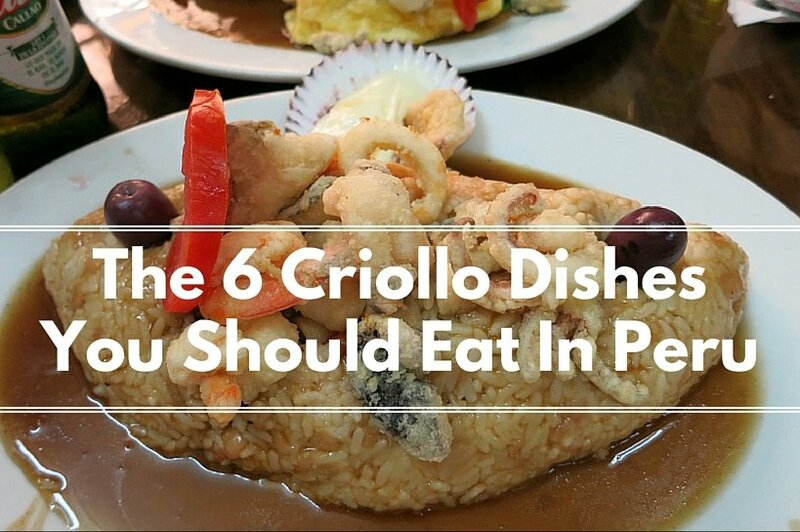 And what are the Criollo dishes worth eating in Peru? The short answer is Peruvian Criollo food is Peruvian “comfort food”or everyday food. It is the food that many Peruvians eat in their homes. Criollo means creole, which commonly refers to people who descended from the Spanish colonial settlers. When it comes to food, the Peruvian native indians had to integrate different ingredients and cooking techniques into their cuisine. These influences came not only from the Spanish but also from the African slaves, Chinese and Japanese immigrants. Peruvian Criollo food is found mostly in the coastal and central regions of Peru where the early immigrants first settled. Ready to indulge in Peruvian home cooking? 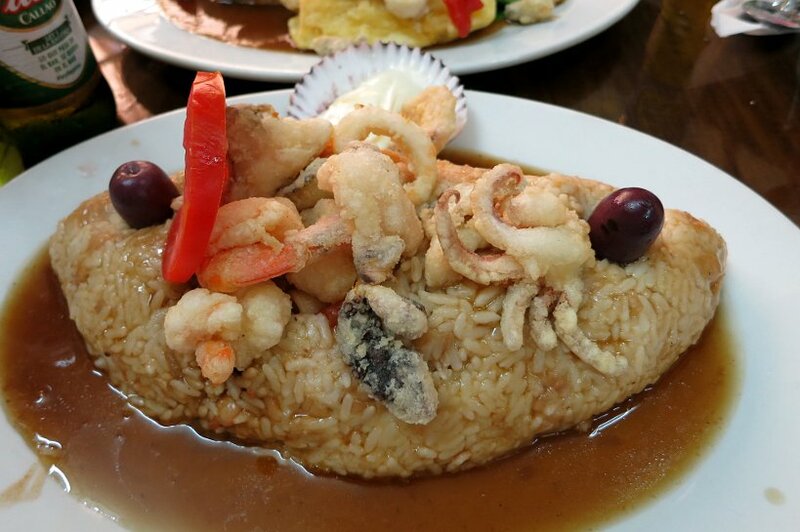 Here are the 6 Peruvian Criollo dishes you don’t want to miss while in Peru. A causa is a very unique Peruvian starter made of potatoes. Not just any potatoes, but Peruvian potatoes. Potatoes originated in Peru and there are more than 3000 varieties. 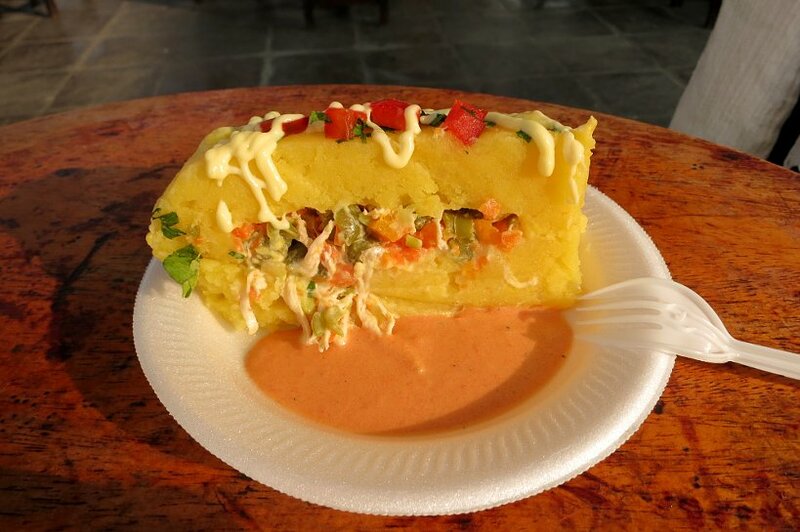 Some people say causa comes from the Quechua word “kausay” (sustenance of life). A signature dish from Peru. there are endless ways to compose and present this dish. 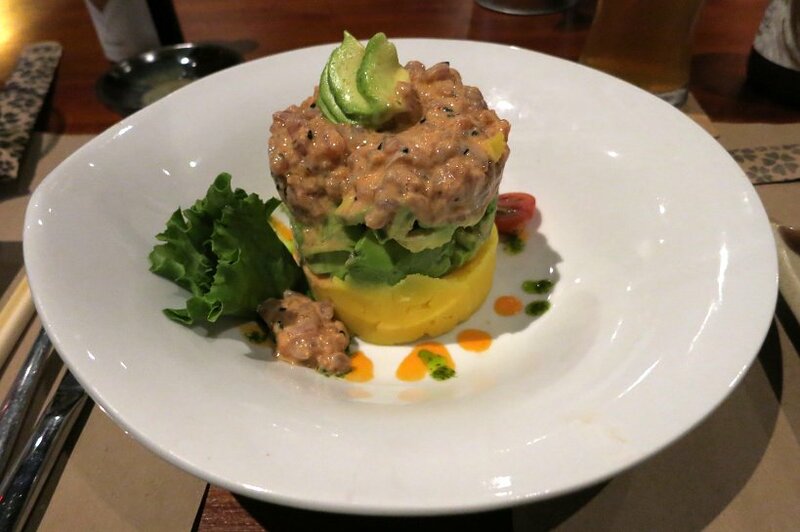 The two most typical classics are Causa Limeña which has potato, tuna, avocado and tomato. And, Causa Rellena which is potatoes stuffed with shredded chicken breast and tomatoes. Read more about Causa Limeña from our interview with Peru Gastronomy critic, Cecilia Morote. Anticuchos come from the African slaves who were brought to Peru by the Spanish in the16th century. The Spanish gave the African slaves the innards of cows which they considered garbage. In a previous post, we talk in detail about anticuchos and how the Africans marinated the meats with spices and smoky chillies from the Andes and created Anticuchos. The most traditional is Anticuchos de Corazon, which are pieces of grilled beef heart. However, you can also get chicken, regular beef or even hot dog anticuchos. 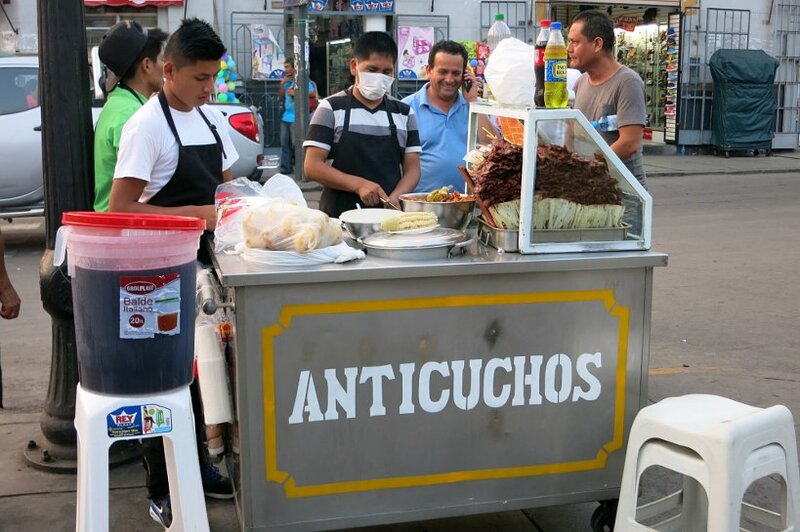 Today, anticuchos are a much-loved street food and favourite late-night dish. Aji de Gallina is one of the most typical native Peruvian dishes. It is a fusion of Spanish and Quechua ingredients. It is a thick cream made up of shredded chicken with yellow chili, bread crumbs, egg, parmesan cheese, pecans, milk, onion and garlic. It gets its bright yellow color from Aji amarillo or yellow chili. Aji is one of the most popular spices that is used to add extra flavor in meals. 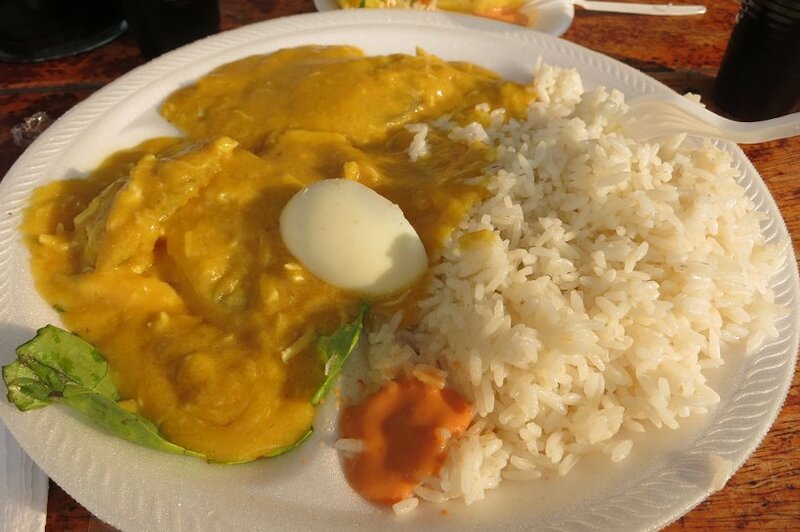 The Aji de Gallina is typically made with boiled potatoes or rice. Served with succulent chicken, this creamy, mildly spicy sauce dish has a delicious combination of flavors. Lomo Saltado is one of the most emblematic and traditional Peruvian Criollo dishes. You can find it easily in any restaurants or farmers market. It is a fusion of Chinese and Peruvian food which makes it a typical criollo dish. 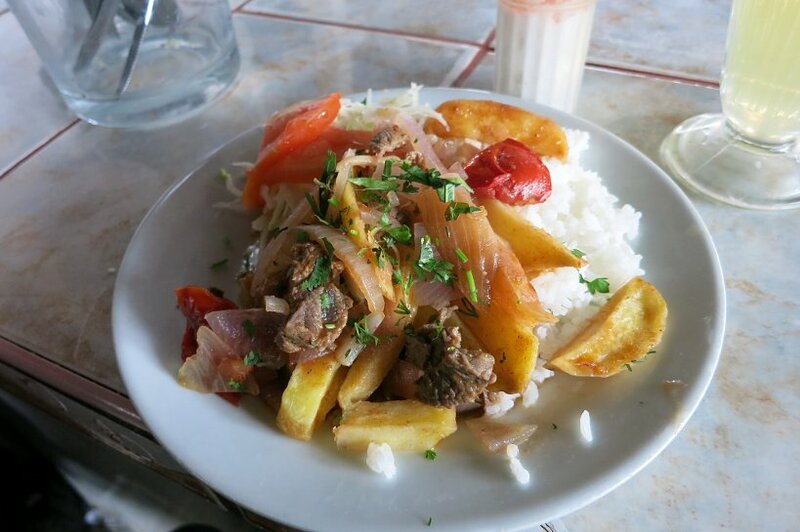 You can read more about it here in our a previous post: Spotlight On Peruvian Fusion – Chifa Dishes & Lomo Saltado. Often served as the main meal on the lunch menu, it can easily be shared. It consists of stir-fried strips of beef are stir-fried with potatoes, onions, tomato and ají amarillo then flavored with a little soy sauce, garlic and cilantro. It is very tasty and one of our favorite dishes in Peru. Tacu tacu is a typical Peruvian dish whose heritage is from the Afro Peruvian community. It is the Peruvian version of refried beans and rice. It is a way to use-up leftover rice and beans in a simple and savory combination. It is usually served as a patty with a cheap cut of beef steak and fried egg on top. Though today you can find it with many variations using yellow chili, different types of beans and vegetables like asparagus and leeks.The rice and beans typically needs to be prepared a day before. We had Tacu tacu at a Cevicheria and it was prepared with seafood. The portion was humongous, definitively enough to be shared for three people. It was a delight! Super sweet, it is worth indulging in this classic Lima dessert. When you sit down for a meal in Peru, you are not just eating, but tasting a fascinating mix of foods and cultures. The Peruvian Criollo dishes are a result of the new flavors and ingredients which combine the flavors of Africa, Europe and Asia. When in Peru, indulge in these 6 must-eat Peruvian Criollo dishes. Be prepared for a culinary and historic journey of the Spanish creole influence in Peru. These dishes are eaten by Peruvians throughout the country, and are in fact, the everyday food. This post was so informative! I’m ready to go to Peru and get my eat on lol. I have heard about Lomo Saltado before but the other dishes were new to me. Thanks Shasha. Glad you enjoyed the post. Lomo Saltado is indeed of the popular favorites. The other ones are worth trying out as well. Cheers! Wow! I have to admit, even though I just ate a few of those would tempt me to eat more. I’m a little upset with myself. I went to Peru a few years ago, and I don’t think I had any of those dished, because I had no idea what to eat. 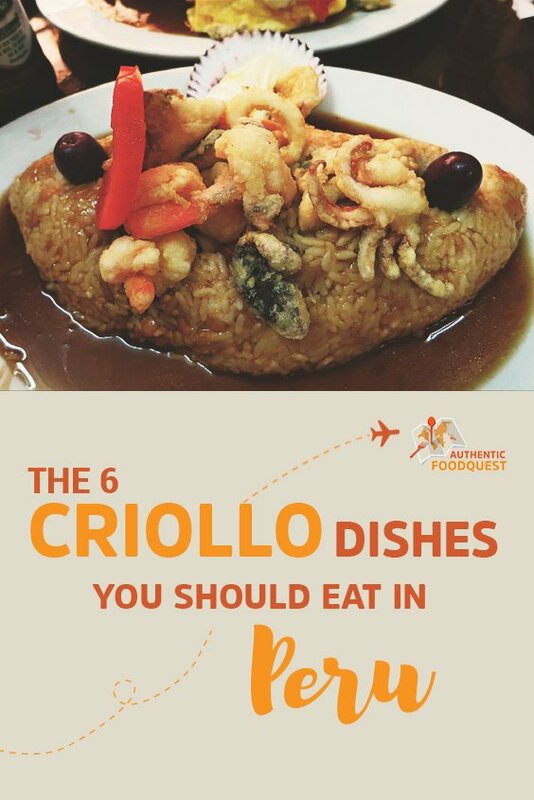 I find it difficult to find “criollo” food or food you would eat in the home in restaurants. They always want to be too touristy. Thanks Corinne…it’s too bad we didn’t have our blog ready a few years ago…we would have highlighted the places to check out 🙂 Nonetheless, glad you tried some of the dishes before. Keep the rest for your next trip and be sure to check out our post about Ceviche where we talk about “Huariques” which is home style cooking at “secret” restaurants. This post made me hungry! I want to try to tacu tacu, it seems right up my alley, especially with seafood. Thanks for your comments. The Tacu Tacu was great and surprisingly delicious. We really enjoyed the seafood or mariscos version. Cheers! Number 4 looks soooooo good. like damn. Get me to Peru! So true, Lomo Saltado is indeed a favorite. It’s incredibly delicious and simple. If you get to Peru, do try the others as well. Thanks for your comments! Wow, I honestly had no idea what meals were eaten in Peru, thanks for the info! That dessert though, oh my God I wish I had Suspiro a la Limeña right now!! Haha ? Great, now I’m salivating lol. I enjoyed this post! Wow, I really can’t wait to eat my way through Peru! These dishes look great! And you share a lot of great information about each of them! Thanks so much Kaylene. So glad you enjoyed the post. Not only are the dishes great, they are so tasty and simple. It’s nice to have so many options at very resonable prices. Thanks for your comments! I really love how you incorporate historical and cultural explanations when describing what you’re eating, it just makes my heart sing. Always love seeing your posts, I learn about so many new dishes! So wonderful to get your feedback Kristina. 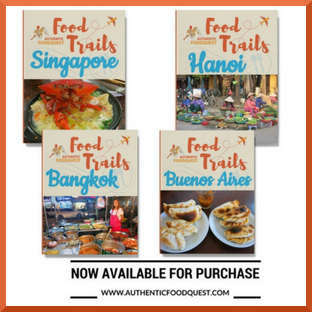 We really aim to inspire travelers to travel through food and have a deeper connection with the local food, people and culture. Thanks so much! This is such an awesome post- I’ve never heard of any of these before. Aji de Gallina kind of looks like curry! Yes, indeed Ivy, Aji de Gallina is like a curry because it is creamy, however it is NOT spicy like a curry. Many Peruvians make it at home and it is a simple, delicious everyday meal. Thanks for your comments! Yummmm I just got really hungry reading that! I would love to try causa and suspira de limeña! Looks so good and very interesting to see all the different cultural influences in the cuisine. Was living there for a few months! Love Peruvian food! Thank for sharing! You are most welcome Marie-Pierre. Did you have any of the dishes when you were living there? You are right, Peruvian food is incredible. Thanks for your comments. I’m not familiar with Peruvian cuisine, but I always want to try something new and this looks delicious. I am going to save this for when I have the chance to eat Peruvian. Awesome Krysten, so glad this article intrigued you. Check out a Peruvian restaurant in your local area and they are bound to have a couple of these dishes. Do let us what you end up tasting. Thanks for stopping by. The Suspiro a la Limena is indeed worth traveling back to Lima for 🙂 Sweet and delicious. Thanks Joanna for stopping by! I think I may gain 20 pounds just looking at the Peruvian comfort food! It all looks so scrumptious – especially the Causa Limena! The funny thing Shane, is when the food is so fresh, healthy with no preservatives, you actually do not gain the 20 pounds. Instead, you savor incredible and delicious flavors. Yes, the Causa Limena is a favorite. Cheers. I haven’t been to Peru (yet) but did spend quite a bit of time in Bolivia so got to sample many ( many) varieties of potatoes. I would especially love to try Suspiro a la Limeña. I love the history of the name and its seems very unique! That’s right Michele, both Peru and Bolivia do have an incredible amount of varieties of potatoes. Did you find a favorite kind? 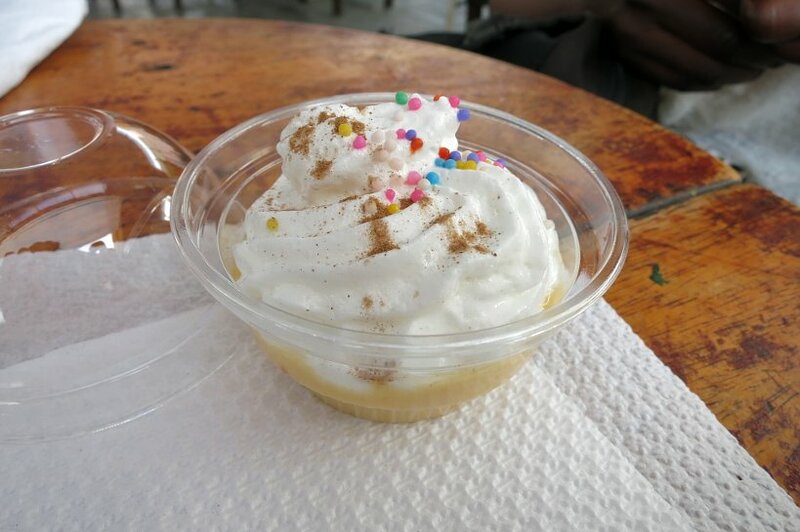 The Suspiro a la Limena is worth the trip to Lima. Don’t hesitate to reach out with any questions when you go to Lima, Peru. Thanks for your comments. Forgive me if I am wrong but what about Papa a la huancaina…. Omg that is my absolute absolute favorite! Mmh, they all look very good and interesting! I would definitely try some, especially #5 looks very good. I love calamaris, so that one seems the best fit for me! Thanks Crissy. Peruvian Criollo food is indeed delicious. The mix of cultures really makes for innovative dishes. They are all good and hope you can make it to Peru to give them a taste!! Appreciate your comments. I will bookmark these in case I ever make it to Peru. My husband went there with his brother about 5 years ago, but they are not adventurous eaters LOL. Thanks Robin. What about you? Do these dishes tempt you in any way? Which ones? Please do let us know. I spent 2 months in Peru a few years back, I think it has some of the best food in the world. My favourite thing to do everyday was look for the Menu of the Day, such a deal with 3 courses for a few bucks, Aji de Gallina was one of my faves! You are right Sheena, you can’t go wrong with Aji de Gallina, a favorite of ours as well 🙂 The menu del dia is quite a good way to go…everything is fresh and as you said for a few bucks you get a delicious 2-3 course meal. Love Peru for that!! Oh this looks like a delicious spread! Your post is making me hungry! This all looks amazing! Loved reading about the history behind the food and how it came about. These pictures make me hungry! Thanks Kristina and so glad that you enjoyed about the food. Learning about the food does make it much more appealing. Appreciate your comments about the article and pictures and hope you can go to Peru soon and taste these delights for yourself. Cheers. I am about the least adventurous food person there is but these sound amazing! I need to be better about trying new things! So glad to read that this has inspired you to open up to new tastes and flavors. 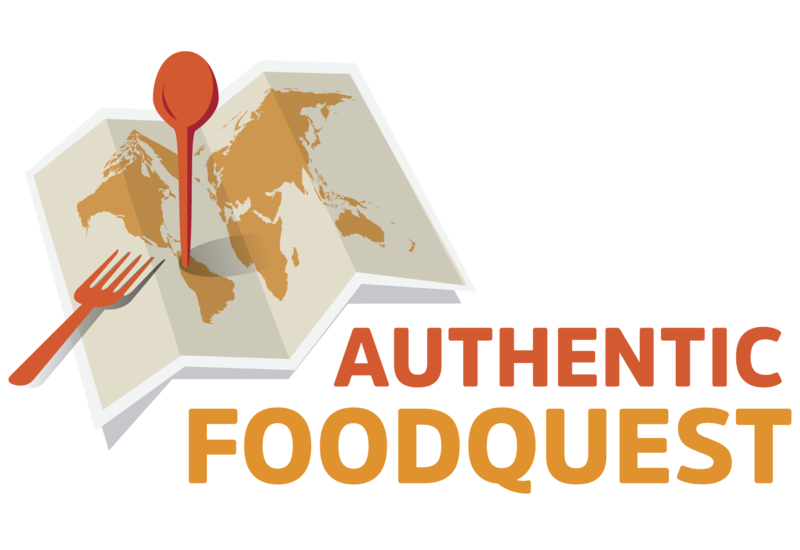 That’s our mission with Authentic Food Quest!!! Do let us know what you end trying that is new and out of the ordinary for you. Cheers. My sister went to Peru in November and I’m sure she tried some of these dishes. 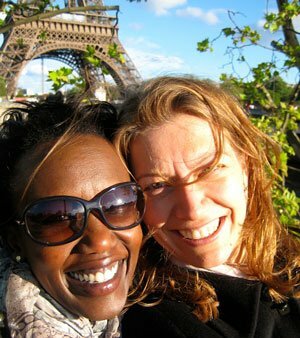 She stayed with her friends that live there and made sure she didn’t have just a tourist experience. Omg, it looks like I need to book a trip to Peru right away! I love trying new dishes when I’m traveling. Everything looks flavorful and delcious. If Peru is in your travel plans, do make a point of giving any of these delicious dishes a try. Alternatively, you can always check out a Peruvian restaurant in your area. Give it a try and let us know what you think 🙂 Cheers! This does look like a fascinating mix of food and I would like to try it all. It all looks so great but I really would love to try the Suspiro a la Limeña first. It looks divine and I love the name. Thanks Pam for your comments and so glad to read that you enjoyed the article and the dishes highlighted. Yes, the Suspiro a la Limena is quite divine and incredibly sweet. To be eaten in moderation 🙂 Cheers. Such delicious dishes. I would chow down on a plate of Lomo Saltado and then end my meal with that yummy looking Suspiro a la Limeña! I have to get to Peru! The food in Peru is definitively worth the trip. Hope you can get there soon, beyond Criollo dishes there are many other cuisines worth indulging in. Poke around the Peru section of this website and get inspired by the other dishes. Do let us know if you need any tips when you plan on visiting the country. Appreciate your comments Annemarie. 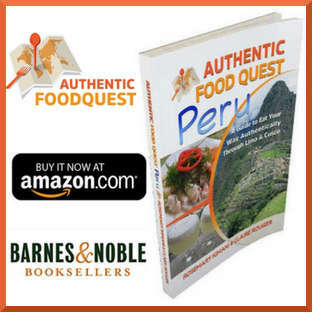 Highly recommend Peruvian cuisine….definitively worth getting exposed to 🙂 Look for a restaurant in you local area and order one of the dishes listed in the article. Don’t forget to come back and let us know what you think. Cheers Julie. OMG, this looks amazing! I’ve never had Peruvian criollo! That lomo saltado looks delish! So glad you liked the article. Lomo Saltado is indeed one of the most popular dishes in Peru. Truly delicious!! Thanks for stopping by Berniedette. Potatoes make up my favorite comfort foods. Didn’t know it was so universal. Need to add some of these yummy dishes to my comfort meals. We’re supposed to get rain this week so it’ll be perfect. If you love potatoes you will love Peruvian food. Loads of delicious and unique varieties. How do you typically make your potato dishes? Cheers! Wow! I’ve always wanted to go to Peru but had no idea what kind of food they ate. These all sound really interesting! I love trying new foods! 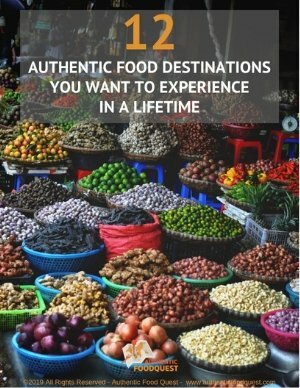 If Peru is on your travel plans, be prepared for a delicious experience. The cuisine is amazing and very fresh. 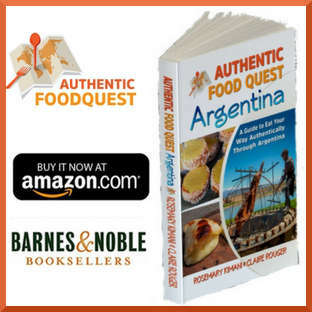 Glad you enjoyed reading about Criollo cuisine. There is so much to discover and enjoy. Thanks Tiffany!